Some good news this week. Many of the hybrids that looked to be dead are finally starting to wake up. Here are some numbers that changed since last week. Jupiter vines increased from 6 to 8 (of 12) vines that have leaves. Zweigelt (v) increased from 2 to 6, Cabernet Franc (v) from 0 to 12 vines with swelling buds, Riesling from 2 to 3 with leaves and an additional 3 with swelling buds, Chardonel from 3 to 4 vines with leaves, Chambourcin still has 5 leafing vines and now has 4 that have swelling buds, Vidal Blanc from 0 to 1 with leaves, and Valvin Muscat from 4 to 7 vines with leaves. On Thursday night / Friday morning (May 15-16) there was a freeze event in Kansas. Low temperatures in this area were in the 30-32F range. 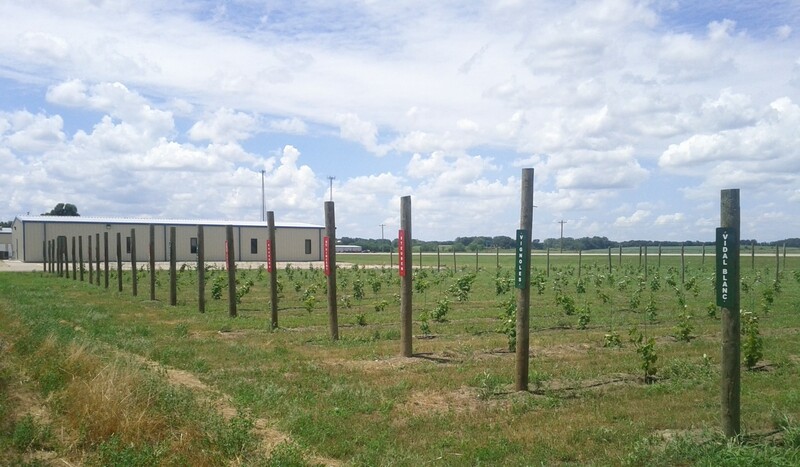 The following vines in the research vineyard are showing some frost damage: Suffolk Red (t), Chardonnay (v), Lemberger (v), Chambourcin, Glenora, Noiret, Vignoles, and Valvin Muscat. The damage varied from just a couple of the 12 vines to all 12. The damage was in the form of shriveled, brown leaves on otherwise green shoots. Some of the vines seem to be VERY vigorous already this season. Marquette and Leon Millot seem to be the most vigorous having already reached the wire (set at 6’), and as usual Seyval Blanc seems to have the most flowers. On a side note: an observation from our Oregon Trail vineyard, 5 miles north of Wamego, the vines there ALL seem to have sustained significant frost damage. The vines all have several brown, curled leaves on otherwise green shoots with other leaves that are still green. How will clusters handle the frost?